After the dust had settled and the Vancouver Canucks walked away with a 2-1 victory over the Toronto Maple Leafs on Saturday, Dallas Smith likely breathed a sigh a relief. The country music star is a big Canucks fan, but he had a little bit more reason than usual to cheer for a Vancouver win. He won this bet with Dart Guy. Dart Guy – if you don’t remember – is the Leafs fan who made headlines during last year’s playoffs. Looking at his outfit, you can understand why. Well, the Maple Leafs diehard will have to change that outfit up a bit. 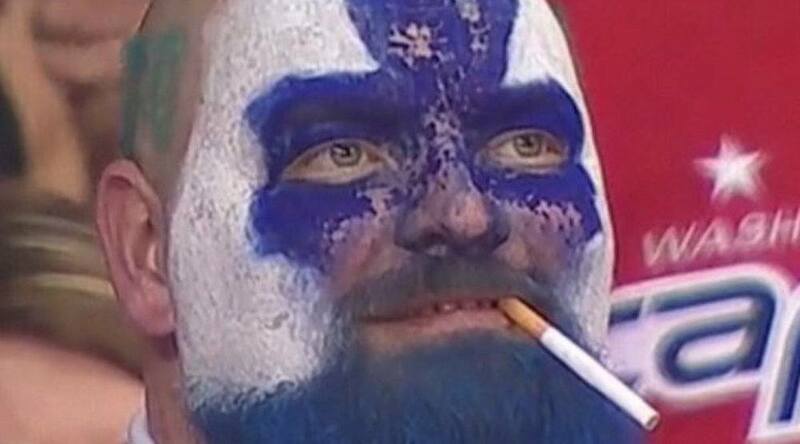 Dart Guy, who lives in Toronto, will not only have to make the trip to Vancouver for next year’s Canucks-Leafs game , he’ll have to do so wearing a Canucks jersey, and his face painted blue and green. And of course, since it’s Vancouver, he might need to swap that dart for a doobie. Dart Guy was feeling confident prior to the game (the Leafs are one of the league’s top teams, after all), but his tone changed after it was over. Smith of course, couldn’t have been happier. Dart Guy has some extra saving to do now. He’s on the hook for his own expenses to fly out to the west coast, unless this ends up working for him. Of course we won’t know what day that game will fall on until next year’s NHL schedule is made. It would certainly be a great game to go to. Leafs vs Canucks is always a good matchup, and both Dart Guy and Smith will be in the building. A BCIT grad who just can't get enough hockey. I do other stuff too, but it's not as cool as hockey.